The Andrew Carnegie Free Library & Music Hall was designed by Struthers and Hannah in 1899. Sited on a hill overlooking Carnegie’s Main Street, the Library and Music Hall each has its own entrance and expression within the building’s classic three-part vertical hierarchy and composition. The two-story Italianate facade has a rusticated stone base, capped with a continuous bracketed cornice and hip roof. The facade is composed of russet colored brick with terracotta trim. 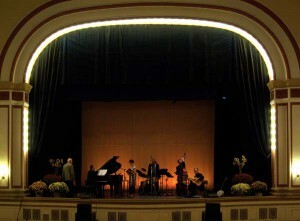 The Music Hall is dominated by a projecting central entrance bay topped with a slightly smaller pediment. 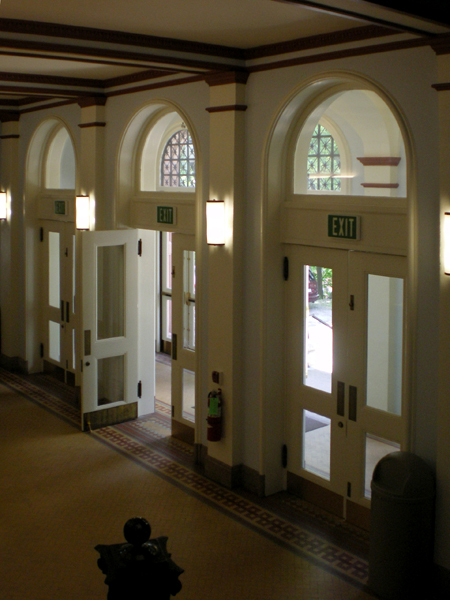 A stair leads to three double entrance doors with elongated arched transoms. An open second story porch sits above the entranceway. Three windows are separated by paired Corinthian columns with brick shafts. Elegant arch-topped windows have circles and patterns that combine with the decorative terracotta to echo the building’s Palladian antecedents. Paired columns, both projecting and recessed porches, pediments and rigorous symmetry are the architectural elements that combine and compose the building’s facade. Scale, proportion and axial alignment convey a sense of dignity and importance. 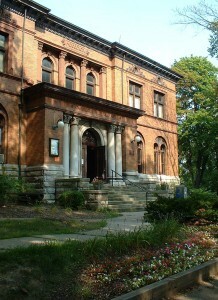 The facility houses a fine public library, an acoustically excellent, 500+ seat Music Hall modeled after Carnegie Hall in New York (the ACFL&MH’s entire exterior bears a striking resemblence to the New York concert hall), a lovely reception hall, studio space and one of the seven or eighth most intact Grand Army of the Republic posts in the country. 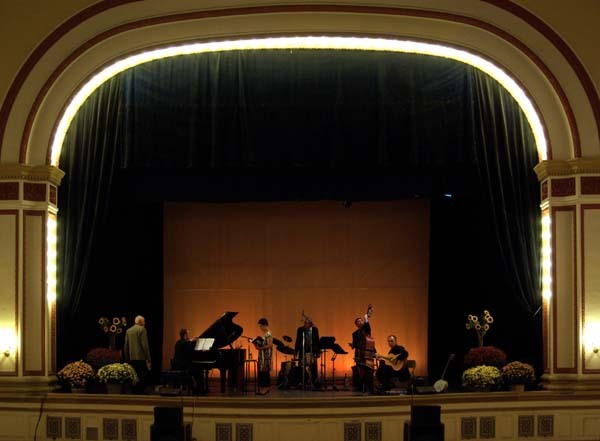 The ACFL&MH serves as the cultural heart of Carnegie.